Broadband is a high-speed way of connecting to the internet. It is at least 10 times faster than so-called dial-up net services that use a modem and standard telephone line. Broadband can be accessed via the phone line (known as Asymmetric Digital Subscriber Line or ADSL) or by cable, wireless or satellite. ADSL uses technology which allows data to be carried alongside normal calls on standard telephone lines. 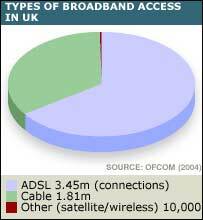 Cable broadband is carried via optic fibres, which also provide digital TV and telephone services. Wi-Fi or wireless works by converting internet data into a radio signal which can be picked up by a special adaptor on each pc. Satellite technology is still in its infancy and very expensive but a two-way connection will allow you to transmit and receive data via satellite. Access speed is measured in bits per second: 512 kilobits (512k) is 10 times the speed of dial-up; 1 megabit (1mb) is 20 times faster and 1-2mb is now the standard broadband connection speed. The two big advantages of broadband over dial-up are that it frees up the telephone line for voice calls and can be left on permanently. It still requires a modem, which is paid for when you sign up. Broadband allows you to browse the internet much faster as the pages download more quickly. It can be used for downloading files, such as music or films. In the first quarter of 2005, 4.6 million tracks were downloaded, nearly as many as in the whole of 2004. Broadband can be used to view video clips, take part in video conferencing and online gaming. Increasingly, people are using it to make telephone calls over the internet. Super-fast broadband, or ADSL2+ technology offers speeds of up to 22mb. It is initially available only to homes in urban areas - although critics say most customers will not attain anything like the top speeds promised. Customers will need to pay a one-off connection charge and buy a wireless router. New broadband services are being offered bundled with telephony and video on demand, which is bringing prices down. Within the next five years, Internet protocol TV or IPTV will mean TV will soon be delivered into homes over the internet. Broadband television will provide limitless access to programmes and does not rely on the traditional broadcasting network.